Bernice Noyes — an important woman inventor ? When identifying and listing women inventors in patents, it is normal to rely on the forenames. Even in the late 19th century it was very unusual for American patents to state “Mrs”, and virtually unheard of for words like “spinster” or “married” to be used. British patents until the mid 1920s were more likely to give such indications (maybe 25% or more, I haven’t quantified it). The problem with forenames is that some are not unambigiously feminine. “Mary” may sound female, but Michael Mary Brophy, with 24 British patents between 1894 and 1928, is presumably a man . Two French patents in his name give him as M., Monsieur, rather than Mme. or Mlle. (they did not always get the designation right, but normally did so). “Marie” is commonly used in a similar fashion by Frenchmen. I have noticed in Autumn Stanley’s book Mothers and daughters of invention that she treats a British inventor with the first name Bertie as a woman. In the UK Bertie is almost exclusively used by men, and when I checked the patents found that he described himself as a gentleman. Many American men do use forenames that to British ears sound female (John Wayne was born Marion, after all, and a man who won a Navy Cross at Pearl Harbor was named Doris). How, in the absence of other evidence, can you assume the gender of an inventor ? There is the case of Bernice J. Noyes of Boston, MA who from 1887 and 1917 was responsible for 24 patents, mainly in electrical signalling. Many can be found in Google Patents. As a woman Noyes would count as one of the most prolific inventors ever, but the difficulty is that Bernice was actually a man. I guessed this might be so when on Google Books I came across a reference to Noyes as a patent solicitor, a trade which at the time I would assume to be entirely, or almost so, male. I had a look at the census returns for Boston on Ancestry.com and found him described as M, a man, married to Florence, and termed a patent solicitor. Here, at least, I had hard evidence that Bernice was a man. It is hardly feasible to look each person up. A lot of research has been done on women inventors in the USA, but little on those in the UK. Until a year ago I worked as a patent specialist at the British Library. I developed an interest in women inventors due to a request for help by Deborah Jaffe. So, as you do, I decided to try to identify all women who had obtained a British patent from earliest times to 1899. No doubt I’ve missed a few, but so far I’ve identified over 3,300 — mainly by repeatedly searching using girls’ first names in a variety of sources, or looking up known inventors on Google Books or in annual name indexes. They are on a spreadsheet. Not all were the actual inventors. The British system did not distinguish between inventor and applicant, as did the US system, and instead favoured the applicant. Hence if Jones finances Smith in an invention, or runs a company and employs Smith, Jones is mentioned, and perhaps Smith, but the fact that Smith is merely the financier or employer is not mentioned (but the latter may be implied). This is a real problem. Are the women inventors, or financial backers ? I have identified about 190 of the 3,300 where the woman is not the actual inventor but is involved in getting the patent granted. Some are easy to identify. They may “communicate” an invention by a man (usually a relative), or may be the executrix or administratrix of a man (probably the husband or some other relative. Others are harder — they have a US patent as well, which make it clear that the rights were assigned to them. British patents do have a great advantage over US patents. They are much more likely to give full address details, to give full middle names instead of initials, and to provide details of their marital status or of employment. As the assignment details are so valuable, it is good to try to match up the patents for those women who patented on both sides of the Atlantic. I intend in the future to post on a frequent basis, giving more details and examples of some of the inventors. Stephanie Kwolek, the inventor of Kevlar, died on 20 June at the age of 90. She was a qualified chemical engineer when she joined a research team at DuPont in 1946. The company was at the forefront of the development of new polymers and plastic materials. Kwolek was tasked with researching the uses of polymers and low temperature condensation processes to develop new fibres strong enough to reinforce car tyres. In her research she discovered an unusual molecular formation in the polymer she was developing. Initially, her peers dismissed the irregularity, but she persevered and found that this new material was much stronger than steel. This was patented in 1963 as ‘Fluorine Containing Aromatic Polycarbonamides’ as a ‘novel and useful class of polycarbonamides’. From the beginning these fibres were able to withstand great extremes of heat and cold and were developed into Kevlar, the very strong, fireproof, yet lightweight, and bulletproof fabric. Today we take bulletproof vests worn by the police and combat forces for granted, these are made from Kwolek’s Kevlar and one million are now in existence around the world. They have been refined and styled to fit different sizes and tailored for men and women and Kevlar is also used in fire-fighters’ boots, bulletproof helmets, fibre optic cables, car braking systems and skis as well as in space vehicles and for landings on Mars. During her career, Stephanie Kwolek was involved in 28 patents for Dupont, some as the outright inventor and many as part of a research team. She seems to have been modest about her achievements, but there is no doubt that her attention to detail created something extraordinary. 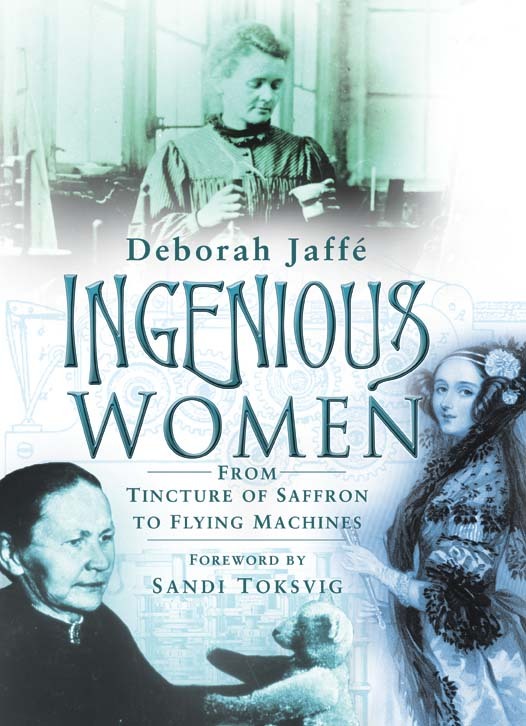 Deborah Jaffé, author of Ingenious Women, will give a paper on Women and Patents at the Women in Science Research Network Conference, Revealing Lives, at The Royal Society, London, on 22nd & 23rd May 2014.